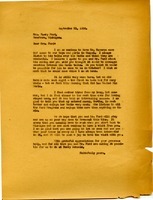 Letter thanking Reed for his mother's donation to celebration Martha's "Silver Wedding" at the Berry schools. Berry mentions missing spending time with Mrs. Little and Mrs. Crozer. Martha mentions that she is alone at home now except for her "old 'black mammy.'" 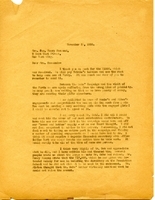 Martha Berry writes to Mrs. Henry Ford because she is anxious to have Mr. Cameron, who she frequently listens to on the radio, come and speak to the students in chapel--hopefully in October. She goes on to speak of the summer's lingering heat and a recent rainstorm--the first in weeks--that has made her feel that "God has Washed His World." She also wishes to inform Mrs. Ford that her "colored mammy," Martha Freeman, is feeling much better and enjoys listening to all the Ford Programs on her radio. Overall Martha Berry hopes that Mrs. Ford and her husband will stop to visit on their way down to Savannah, Georgia. 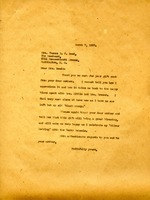 Martha Berry thanks Mrs. Hammond for a recent contribution. Martha Berry is worried that the school has gotten some negative publicity lately for having well-known donors and other donors have started sending their money elsewhere. Berry also mentions that her mother and her "old black Mammy" aren't very well, so she tries to stay close to the schools.